A couple of posts from newly made topics have been moved into this topic. I already ordered my next Pendolino. Do you have a website for this where they show the liveries? Halling has gone into restructuring without self-administration. I don't know about all the Trix decoders in their N-Scale, but at least some of them are D&H DH14 decoders with custom firmware. Trix has their "own" 14 pin interface they use and D&H makes decoders with that interface and I have used many of the standard (non custom firmware) 14 pin ones in various Trix locomotives. I have a couple from Trix that came with DCC installed from the factory and had no issues with my NCE Power Cab. Newer Trix 14 pin decoders made by D&H can be reprogrammed with the standard firmware, but then you lose any custom functions that Trix added (to control special lighting etc). I'll find out for sure soon. I can't resist getting this lil' feller. No. Still waiting for Revolution Trains to put them up, but if you want to check the liveries just google the reference number plus Virgin Pendolino (ex. 390107 Virgin Pendolino). The reference number is actually the real train number. Look for photos or videos. Just remembered this come up with my new IZA Cargo Wagons order. So I scan it for you to see, and as far as I know, thats all they put out so far. 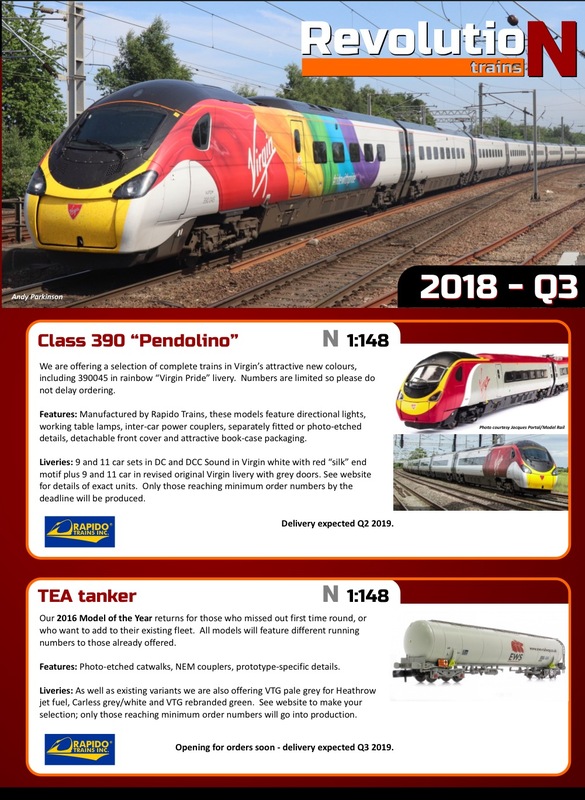 Rapidotrains announced in their newsletter that they will be taking preorders of the new liveries soon. I’m on the fence of getting one, since I already have the Alstom version. I find the silk ones a bit boring but the pride one is nice. Too bad it’s only on one cabin car, not both. NS Vectron (Amsterdam - Berlin Intercity) in analogue and Digital + sound variants. 2 different loco numbers available. 139 for analogue, 229 for digital + sound. Available around Q2 2019.
which raises the question, when are they finally doing the SNCB vectron again???? - LS Models 97021 NightJet 6 part, coming for christmas if you have 432 Euro's. I did get their 2 cars a pack OBB epoch 4 sleeping car sets. You have to get both ep. 4 packs for the 4 different running numbers. On the other hand, the ep. 5 variant is only available in one 2 car pack. At least the ep. 6 (or 7?) nightjet will be complete for those who collect modern trains. - Minitrix 16210 BR 210 in brown color, 280 euro. Anyone know when Lemke is finally going to produce their Berlin S-bahn model? It seems like it's been on their website for literally years. Release of NSB RE460 + accompanying cars (which run between Bergen and Oslo) in 2 different liveries. Price and release date not yet known. Especially interesting are their re-releases of MAV (Hungary) /CSD (former Czech-Slovakia) /CFR (Romania) car sets. Those used to fetch a lot of money on EBAY (70-80 euro a pop) so it's nice to see them re-released. - 15996 DR CFR MAV 3 part set "Balt-Orient-Express"
- 15995 DR 3 part set "Balt-Orient-Express"
- 15997 CSD 3 part set "Balt-Orient-Express"
- 15372 SNCF 3 part set "Orient-Express"
- 15373 SNCF 2 part set "Orient-Express"
Happy to see also that there is some more CD (Czechia) love from Minitrix. For some reason they also decided to release their own version of the NS Traxx, on top of the ones that Arnold are already doing. But this version is also with sound. Still no sign of the NS ICR car re-release. For the Coca Cola lovers there will also be a DB S-Bahn in Coca-Cola livery. and a re-release of their Crocodile. Which has a mysterious "Plastic with Metal on the inside" description? There are also some other releases though these are not that noteworthy. To me anyway. Also I am still waiting for many announcements of the last 2 years that are currently still MIA. Fleischmann released their 2019 catalogue with a few more announcements. and a re-release of the SBB ICN cars which INEXPLICABLY still do not have a restaurant car! Brawa has announced their new items for 2019: There aren't any (except some older goods cars). Probably because they never released their 2018 stuff. Arnold pushed back their release of the ICE-3, ICE-3M, Renfe Velaro from March 2019 to July 2019. Having remembered they forgot something, Minitrix will release the models announced for 2017 (such as EC Moliere east european set, 15698, and CD 3 part sleeper car 15737) in February 2019. SBB Panorama car Gotthard Express has an updated release date of March 2019. Re-release of CD/ÖBB Railjet in their original, non-ad plastered liveries. CD Railjet will receive the slightly updated livery with "RAILJET" in large letters on the side, just like its ÖBB counterpart. Kato ICE 4 scheduled for release May 20, 2019 per photo at the Nuremberg Train Show on the Kato USA web page. No real new developments though. Mostly colour variations. This is normal. They always show all kinds of interesting stuff, since proper kato will attend, not “pretend kato” (I.e. Lemke) with a somewhat regular exhibition of all kato products. It’s a nice time for everyone in the business to meet each other, far away from plebs like us. FYI, I preordered my Kato ICE4 from Hobbysearch in Japan which seems to be considerably cheaper (after currency conversion) than the usual US importers or German retailers. Re: the other announced ICE models - not sure what Fleischmann is thinking as neither the ICE2 as offered nor the new ICE1 produce prototypical sets. In the case of the latter you end up with too many 1st class coaches and not enough 2nd class coaches. The Minitrix ICE1 model unfortunately has always been inadequate due to the oversized cutouts for the bogies on the sides of the coaches. The Arnold ICE3 re-releases should be interesting. The NS version was previously only briefly available pre-Hornby merger as a four car set and the add-on coaches were almost impossible to find. I look forward to adding that one to my existing DBAG ICE3, since I rode the real NS version many times.